Last Saturday was a gorgeous day so what better way to spend it than to point the car in the direction of the Atlantic and head over to Rhode Island to find something good to photograph? Of course, the real trick was to try to find a route of travel that wasn't packed with beach-goers off to take advantage of the good weather and work on their tans so to that end Amanda and I snuck into Westerly via the back route otherwise known as Route 1A. 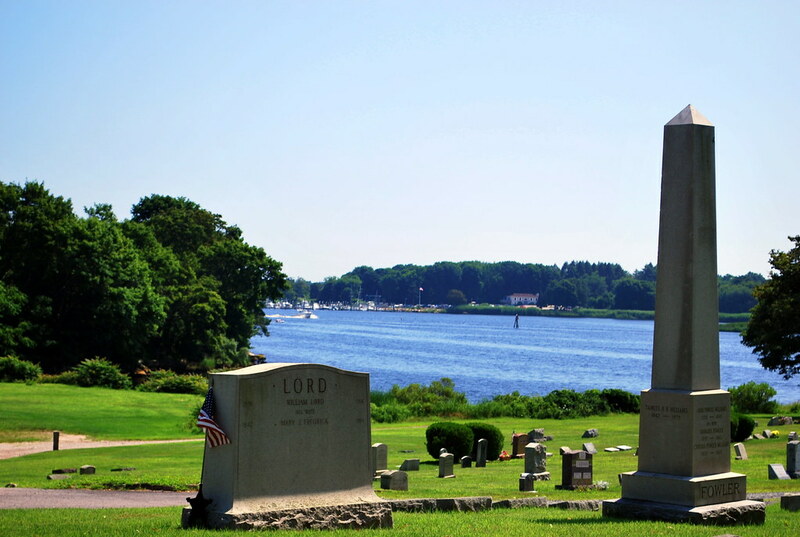 Before we even got close to Watch Hill as we were driving down Beach Street, aka Route 1A, towards there, a rather large and gorgeous cemetery on the right-hand side of the road caught my eye and I just had to double-back to check it out. What can I say? 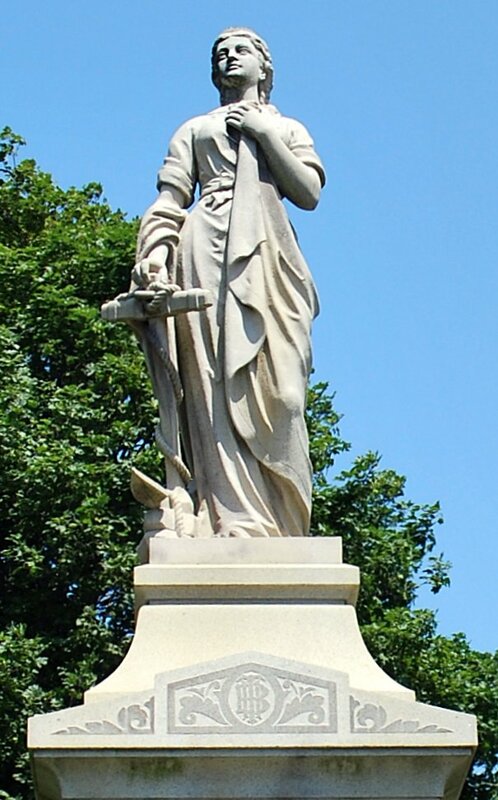 I'm a sucker for beautiful cemeteries, especially ones with interesting statuary! 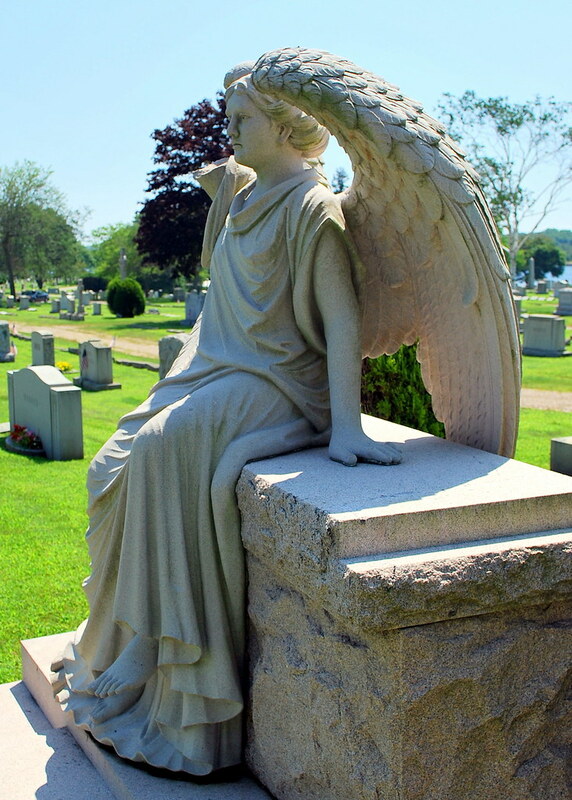 It was, in fact, this very angel here who caught my eye as I was driving past and I just knew I had to go back and take some pictures as it was easy to see even from the road that she was an exquisite carving. Sitting on top of a stone marked "Monti", she really was quite regal even though she was - unfortunately - missing her right arm. I can only wonder in what pose that missing limb had been carved - was it held upright perhaps holding something towards the roadway? A sword maybe? Or a flower? I can only guess as there's no way of knowing unless somehow, somewhere I can find another picture of her when she was still complete and whole and so far that search has turned up nada. The above picture is the back of the angel and the gorgeous wings that she sprouts. It shows how intricately carved the details were and how beautiful the craftsmanship is. 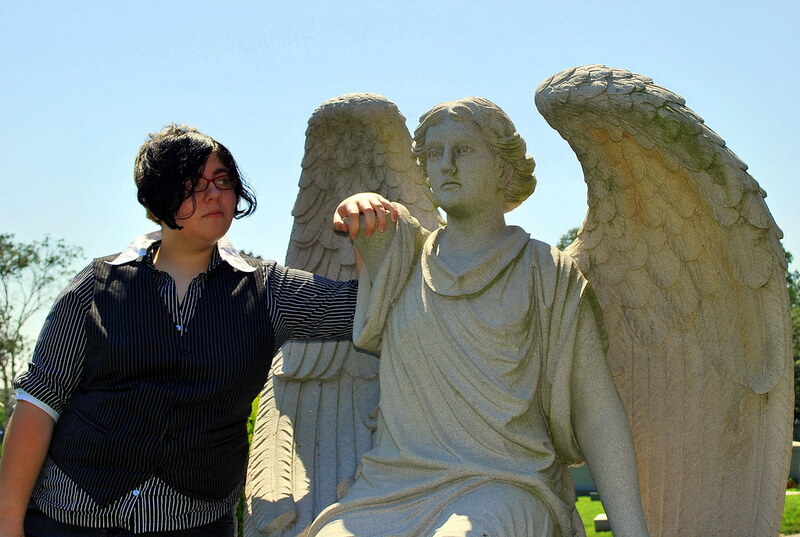 Of course, Amanda had to have a staring contest with the angel based on that whole Doctor Who 'don't blink' thing and then we backed away to find some more interesting statuary. 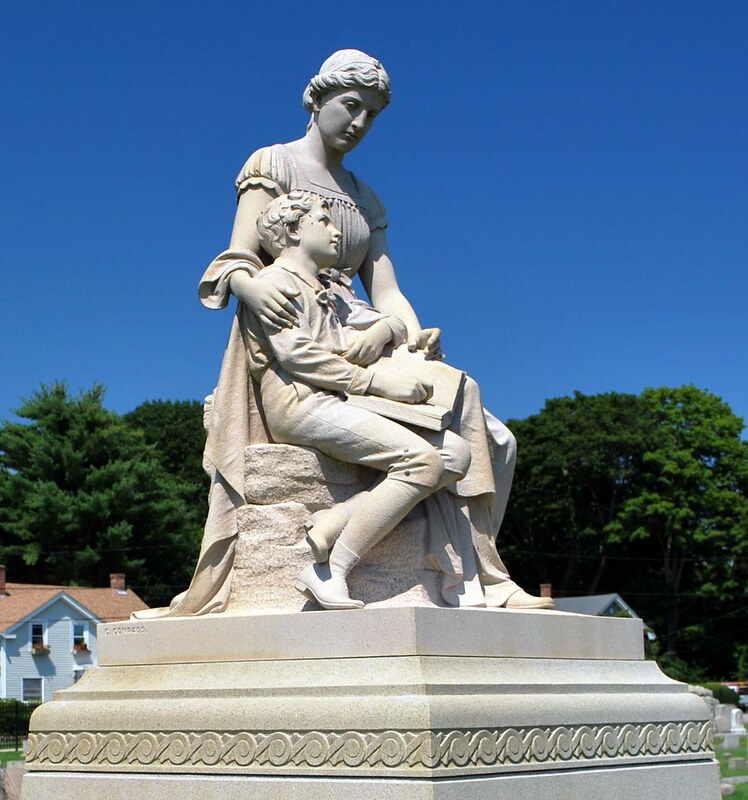 The cemetery that the unblinking angel beckoned us into was established in 1849 and originally known as the Elm Grove Cemetery before someone decided that its location on the eastern bank of the Pawcatuck River lent itself more to the name of River Bend Cemetery. It is an absolutely gorgeous cemetery and probably one of the best well-maintained ones I have seen in a very, very long time. River Bend was established just five years after my favorite cemetery in Norwich - the Yantic Cemetery; but unlike Yantic, it's still a very active cemetery and doesn't look like the families of those people who are buried there have moved on with their lives and forgotten all about the loved ones they've left buried there. Instead the grounds are more like a park and walking through there doesn't give you so much a sense of desolation and loss but of celebration and remembrance. 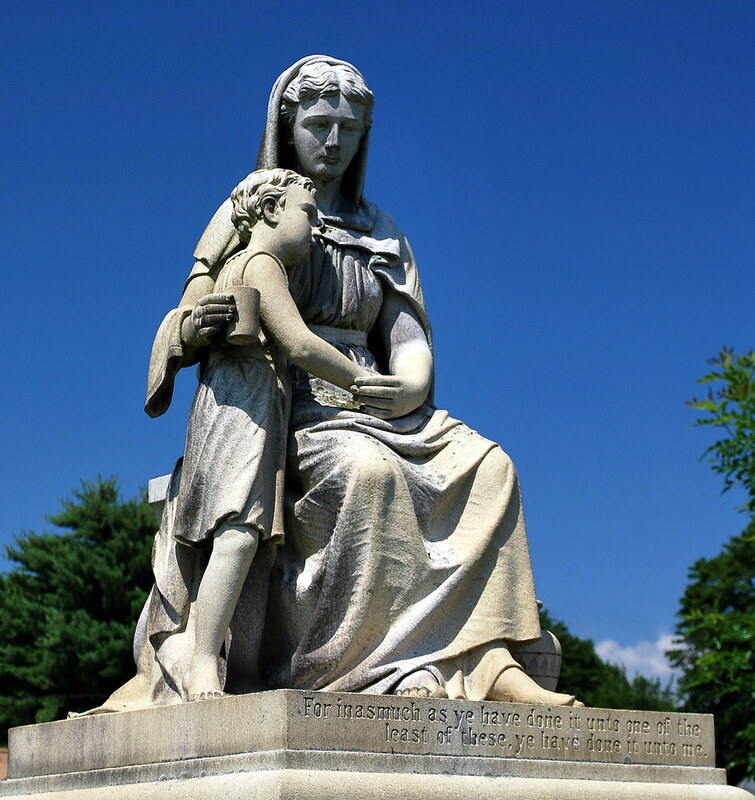 More cemeteries need to be that way as death is as much a part of living as is birth; the problem is most people don't seem to want to face that. Doors on the Hartunian Family mausoleum. As always, I'm sure that there was a lot more to be seen so perhaps another trip is in order the next time I'm over towards Westerly (my son lives very close to there). I read on their website that the cemetery is the final resting place of two Congressional Medal of Honor recipients, I'd like to go back and pay my respects sometime as well as walk amongst the stones of people who were well-loved in this life and are now well-missed. 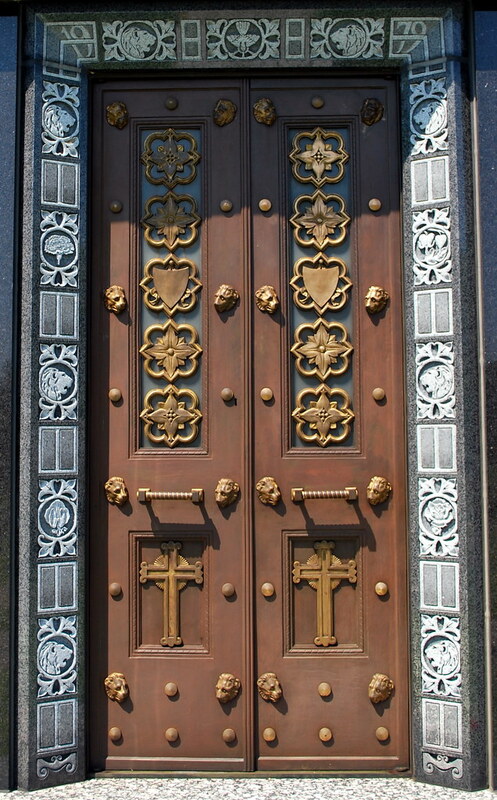 The doors on the Doors on the Hartunian Family mausoleum are spectacular. Great photos as always Linda. I agree the doors are unique and stunning. Amazing statues, indeed! If you're not careful, you're going to make cemeteries vacation destinations! 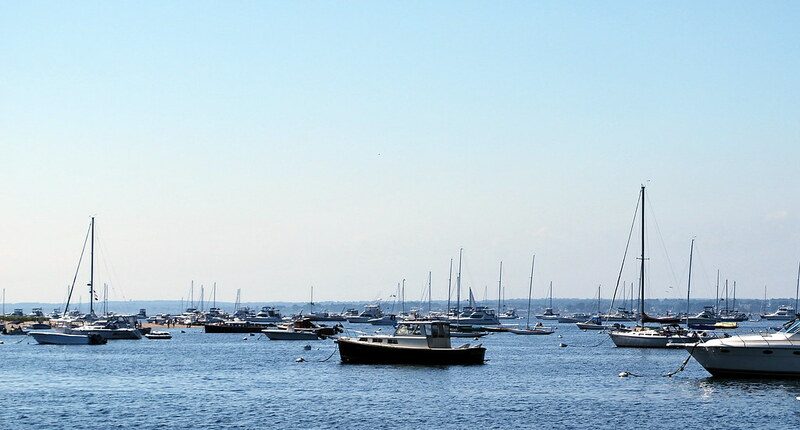 You had me with the water and all those boats. I do love the statues though especially the angel. What workmanship. What a fun excursion. i love old cemeteries too and that one is a doosey! wow, the statues are wonderful! There seem to be so many beautiful cemetaries where you are. Those are beautiful pieces of art. Thanks for posting. It is important to remember our forebears. Great photos. Oh I love the last few post you have done..the cemeteries are so beautiful. 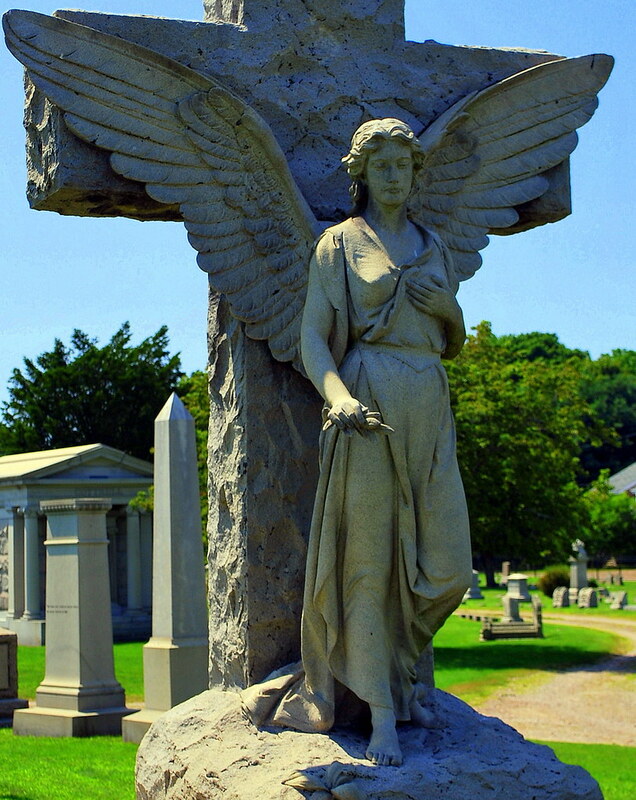 I took a trip to Hollywood Cemtery in Richmond VA. over the weekend, I will be posting about it soon. I have a thing for doors and pathways. This door took my breath away. Beautiful statues, blue skies and the sea... what a day. 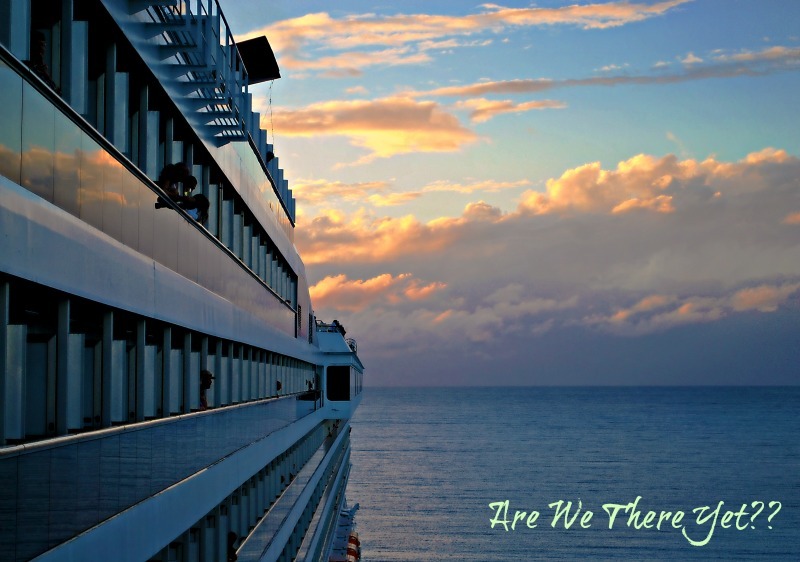 Thanks for sharing your travels with us. 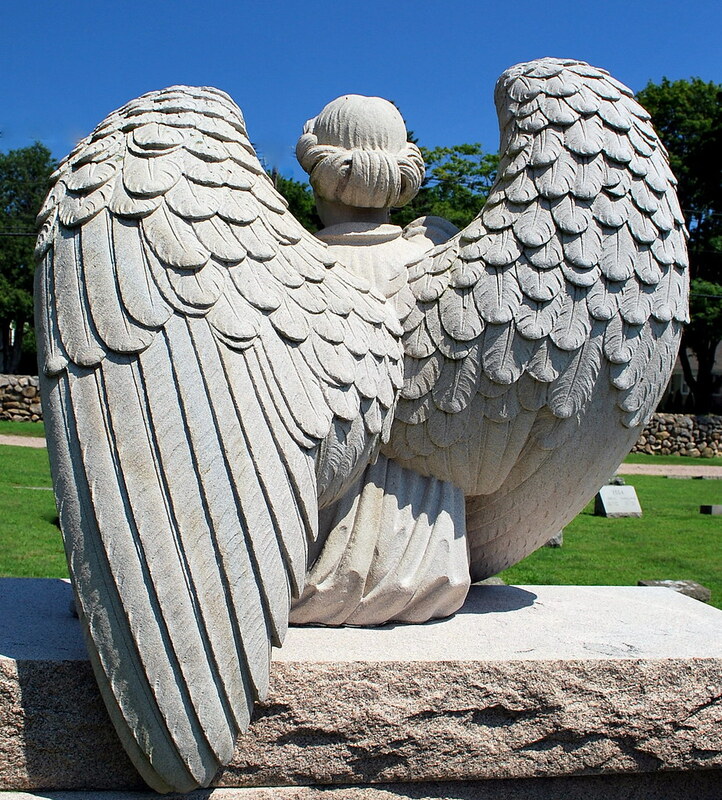 the angel's wings, especially from the back are amazing!! 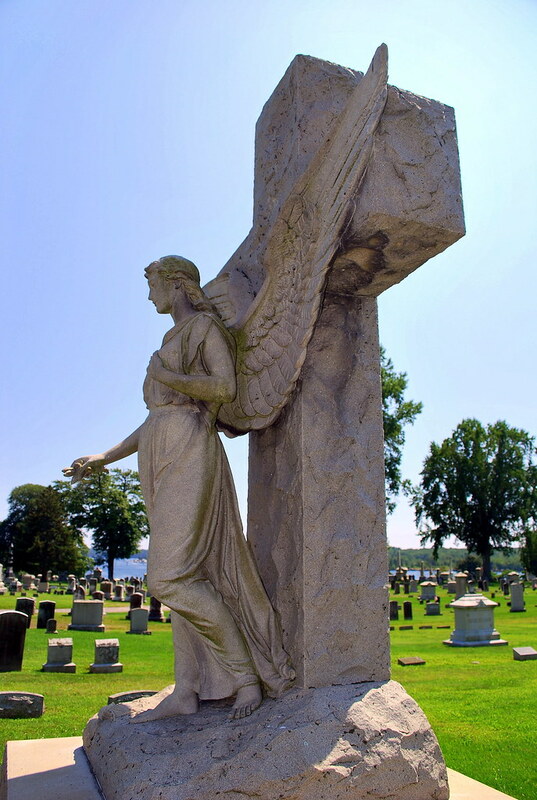 These are wonderful sculptures and it is such a beautiful and well maintained cemetery. you are accumulating an excellent portfolio!